This group of brightly colored birds is located in warmer areas and in particularly in tropical forests. These birds are noisy and sociable in the wild. They have also been popular pets because of their beauty, intelligence and learning skills. Some can mimic human sounds. 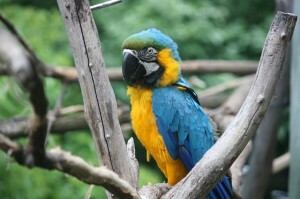 Parrots have large heads, a short neck, and a hooked bill. Their feet have two toes pointing forward and two pointing back, which is ideal for climbing trees and sitting on branches. They can fly with great speed and can maneuver very well. They feed on seeds, nuts, fruits, and nectar.